White is not a proper white, just grey. 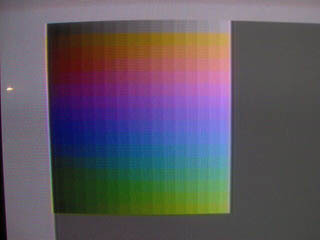 Luminance seems to change in uneven steps, but a higher luminance value is still more bright than a lower value. There are excellent shots of this by Roland Tögel here. 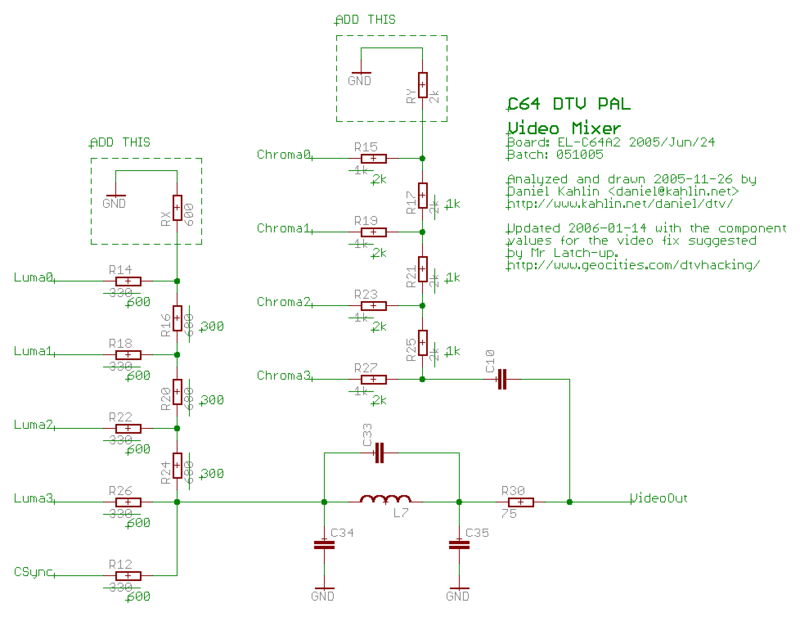 Schematic of the video mixer with the authorative fix shown. The matter is discussed in-depth in this thread on the dtvhacking forum. Note that, contrary to my first thoughts, not having an output buffer could actually be an improvement in output quality. The video-mixer no longer requires a supply voltage. This supply voltage could introduce moire problems if too noisy. 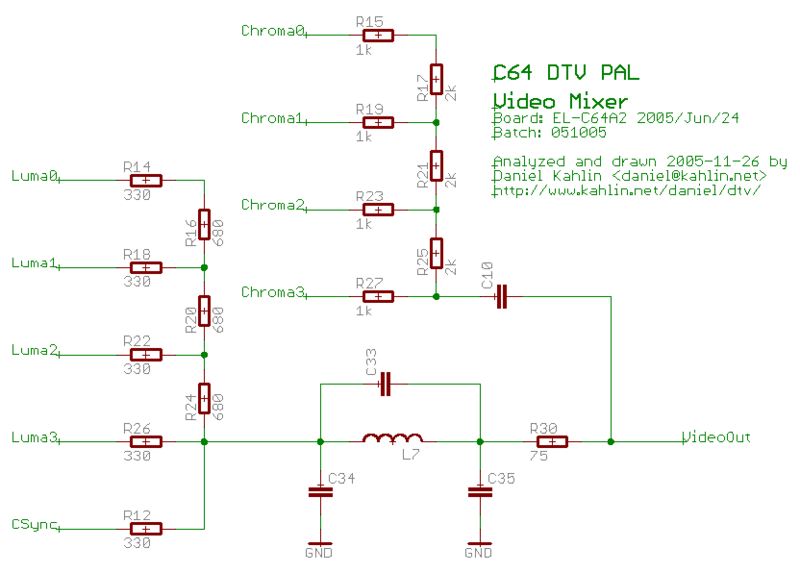 Also it is two resistors and one transistor less + no requirements for supply filtering around the video- and audio-mixers. Chrominance seems to work acceptably as it uses 1k and 2k resistors for its conversion. 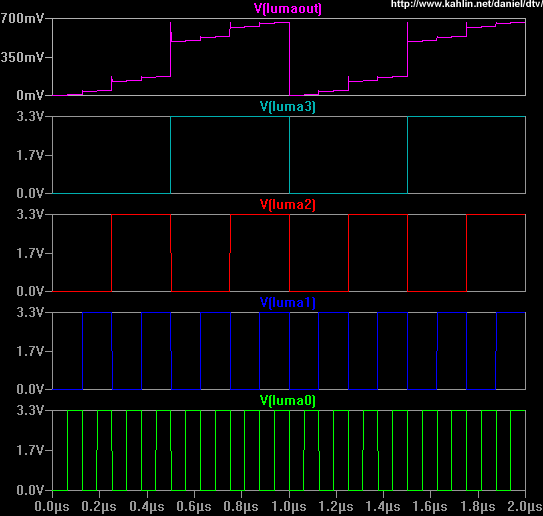 Luminance on the other hand uses values 330ohms and 680ohms, and it appears have a too low signal level, and uneven steps. 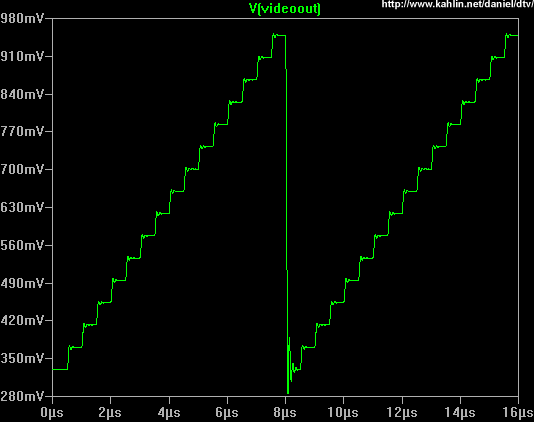 The output of the C64DTV ASIC does not handle that kind of load smoothly. Due to how the resistor ladder is constructed, the load is much higher on the more significant bits. This could result in the uneven steps we see. 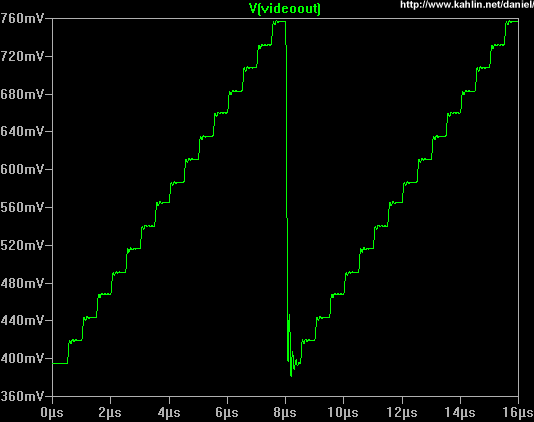 The 3% difference in nominal resistance makes the ladder skewed in the way seen. This could result in the uneven steps. 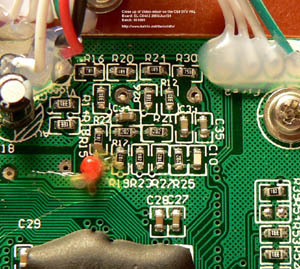 The amplitude of the Luma signal is low because the resistor ladder has too high impedance. 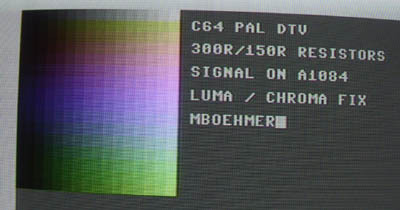 It wouldn't be possible to lower the resistances in the Luma DAC, because the output of the C64DTV ASIC couldn't deliver the load. As MadModder pointed out, the ladder could have the resistors swapped, thus making the steps look strange. Very likely, see below for my simulations! Change R17,R21,R25 to 1k (was 2k). 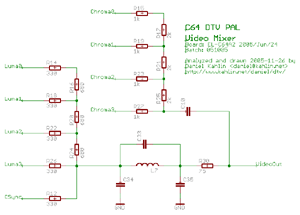 Connect a 2k resistor from the point between R17/R15 to ground. If you have the time and skill, please do these one at a time and if possible send a report with screen shots here. 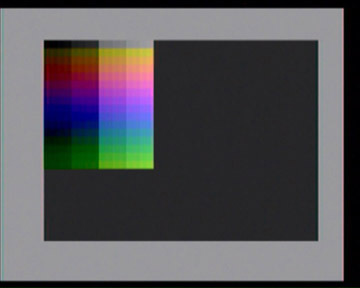 Run this to display a 256 color display like below: displaytest.prg. Note: Modifications are always done on your own risk, and will definately void your warranty! This seems to produce fully acceptable output in the menu of winter games. my comments: this will fix the Luma problem for all bits except Luma0, but the sync level will probably be wrong. 2005-11-27: Nicolas Welte tested setting R14,R18,R22,R26 to 680ohms, and R16, R20, R24 to 330ohms, but then added a crucial fix: 680ohms connected from the point between R14/R16 and ground. 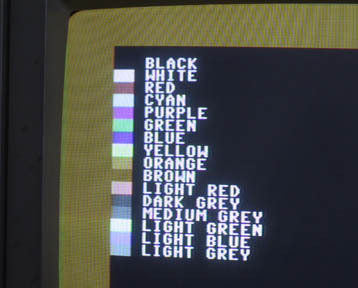 The full range of colors are then available. Although a little bit too dark. my comments: I think the output brightness might be affected in a good way if R12 is changed to 680ohms aswell. In the DTV-Manual it says: "Drives high during non sync times to set black level." 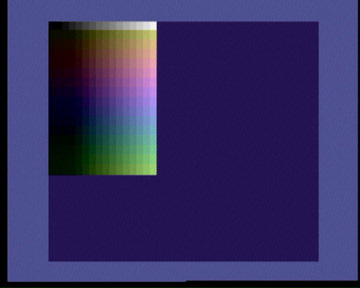 2005-12-03: Michael Böhmer sent me 256-color shots of the mod above. Now if we do the second Luma resistor test above, the screen is still to dark, why? 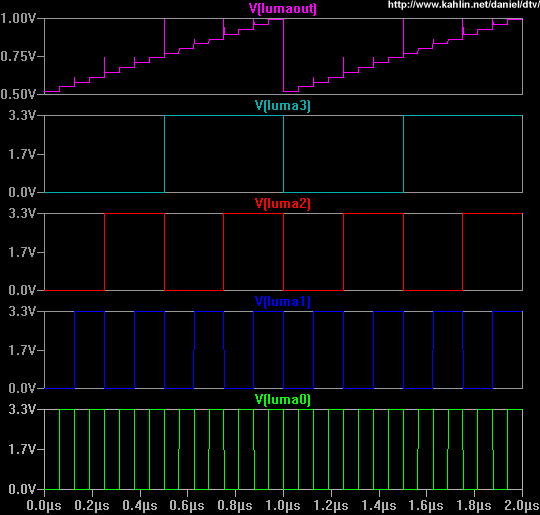 National Instruments has a good page about the video signal. 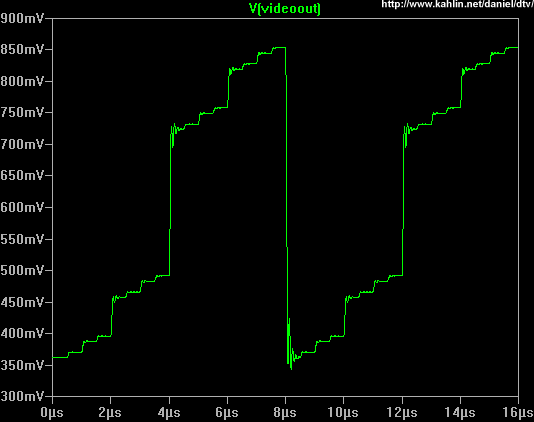 The signal levels are given in IRE, and I translated this into volts below. R14,R18,R22,R26 and R12 to 330ohms, and R16, R20, R24 to 680ohm. Now we look at the levels we get when setting R14,R18,R22,R26 to 680ohms, and R16, R20, R24 to 330ohm plus 680ohms connected from the point between R14/R16 and ground. R12 mainly affects the depth of the sync pulse, so we tweak that last. The simulations below include the full output filter (L7=1.8u, C33=22p, C34=270p, C35=300p) but not possible voltage drop in the drivers. When setting R14,R18,R22,R26 and R12 to 300ohms, and R16, R20, R24 to 150ohm plus 300ohms connected from the point between R14/R16 and ground. 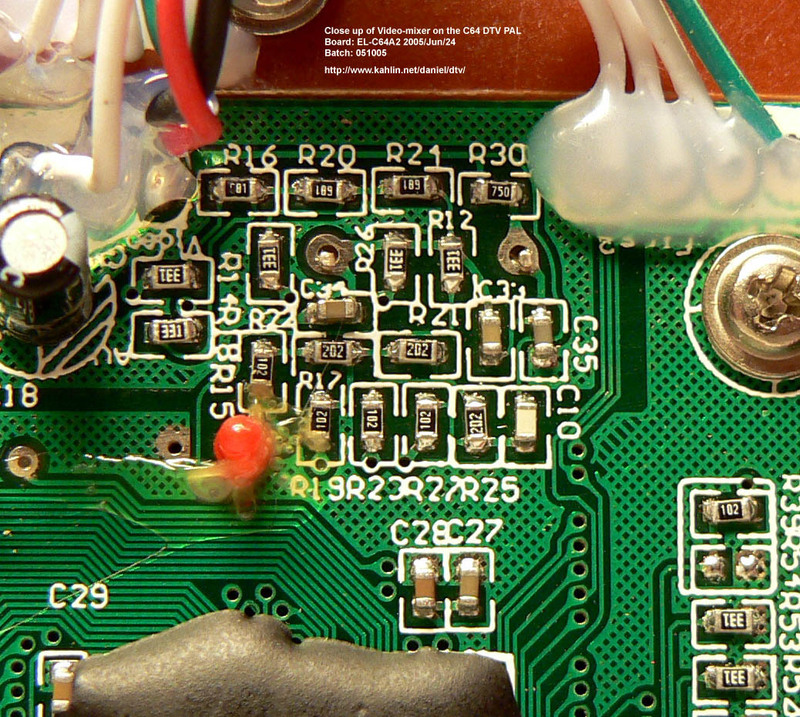 Note: Linearity can be almost perfect if you always mount R16,R20,R24 as two stacked (parallel coupled) resistors. Note: If resistance values get to low, the output voltage of the drivers will start to vary more and more dependant on the binary value. R14,R18,R22,R26 = 680ohms, R16,R20,R24 = 330ohms, 680ohms connected from the point between R14/R16 and ground. Original, with color problem. Looks familiar. Resistors swapped back, Much better! Resistors swapped back, with extra resistor to ground, Very good! Tweaking the level... Pretty good, but still a bit too dark.